CTB 1 (Abell 85) is a faint, closeby supernova remnant (SNR) in the constellation of Cassiopeia at RA 23h 59m 54s and DEC +62d 26m 51s. The field presented is 36′ wide, which barely covers the object. North is up. It was identified as a SNR by van den Bergh et al. in 1972 based upon its optical half-circular shape consisting of radiative filaments. Deeper images taken in H-alpha by Fesen (1993) show that it has a complete circular shape (as shown in my image above) except for the unusual breakout structure toward the northeast, which also shows up in X-Ray images. Distance and age estimates are 10,000 light years, and 7,500 – 11,000 years, respectively. It spans nearly 100 light years. The structure of CTB 1 is quite similar to my image of Sh2-308, in that it is also circular with many filaments and a breakout region. 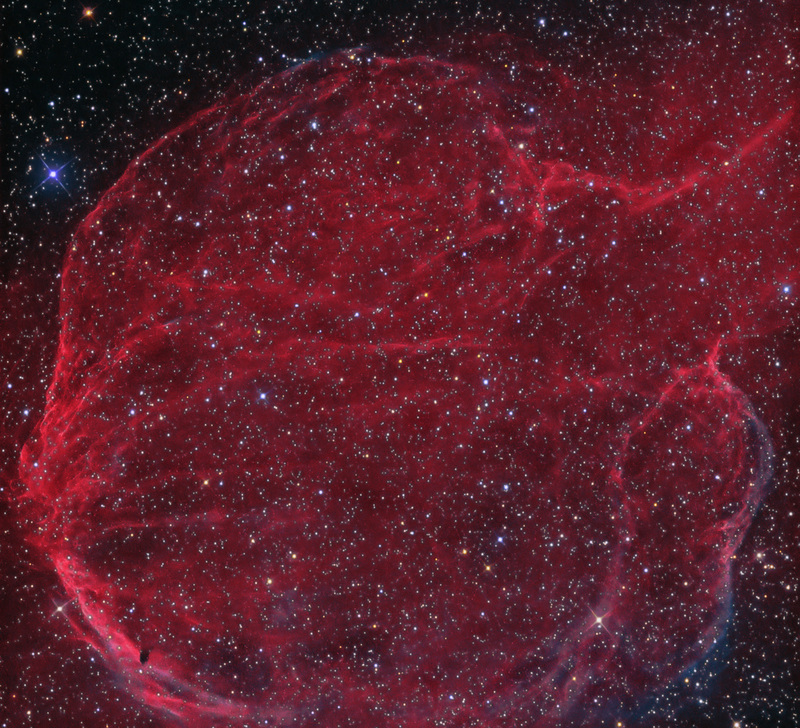 Sh2-308 is considered to be a Wolf-Rayet bubble in a pre-supernova developmental phase. The breakout region of CTB 1 is a referred to as a "shell rupture" and extends 30′ toward the east. Detail in this high-resolution image comes from using narrowband H-a and OIII filters. H-a was color mapped to red/magenta and OIII to blue-green. RGB data were added using a G2V white point.